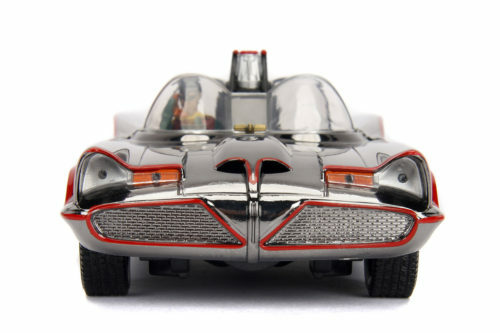 For years, the only Batman ’66 merchandise we could get was either expensive collectibles originally made in 1966, or a DVD of the theatrical film starring Adam West and Burt Ward. Any glimpse of the iconic George Barris-designed Batmobile came when one of the actual cars showed up at a convention display. But thankfully, all that’s changed, and the past few years have brought some great products based on that TV show some call camp, and some call inspiring. Whichever camp you fall into, we can all agree that the Batmobile is cool. 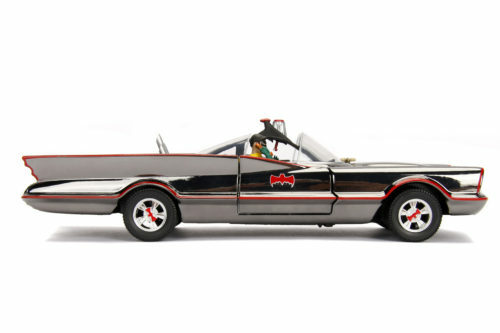 The people at Jada Toys agree, and will be unveiling their die-cast take on the Batmobile at Comic-Con this week, in booth #3746. 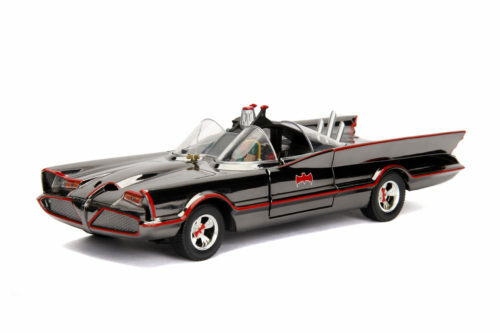 Part of their “Hollywood Rides” line, 30o pieces of this 1:24 scale car will be available for a fairly reasonable $50. From the photos, it looks pretty good — though I do have to ask where is the Caped Crusader himself? I hope there’s a figure of him on the other end of that phone line, talking to Robin in the passenger seat.